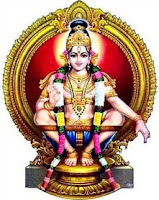 Kalababhishekam is an important offering made by Ayyappa devotees at the Sabarimala Ayyappa Temple in Kerala. It is among the one of the four most important Abhishekams performed at the temple. The puja items used in Kalabhishekam are freshly prepared Sandalwood paste and rose water or Panineer. Lord Ayyappa is also known as Abhisheka Priya due to his fondness for Abhishekam. In the Abhishekam ritual the deity is showered with his favorite puja item. The most popular Abhishekam at the temple is the Neyyabhishekam.